****Update: The Revgear Wrap Wrench seems to be out of production. You can occasionally find one on Amazon or eBay but they’re hard to come by. We were really happy with the product initially but had two of them break before we gave up on it and bought this one from Meister. If you’re into punching a heavy bag, working out in a kickboxing class, an aspiring MMA fighter or a Boxer, then the chances are pretty high that you’ll go through a lot of handwraps. If you have hand wraps then you’ll soon find yourself looking for a quicker way to roll them up. This is why we were on the hunt for for something like this when we came across the Wrap Wrench. The MMA/combat sports world is saturated with gear, apparel and all kinds of other products. Unfortunately, much of it is the same and preference usually has more to do with brand recognition or sponsorship loyalty than anything else. That is why I don’t do many “product reviews”. So, the fact that I am writing this at all should be a testimony of how impressed I am with this product. 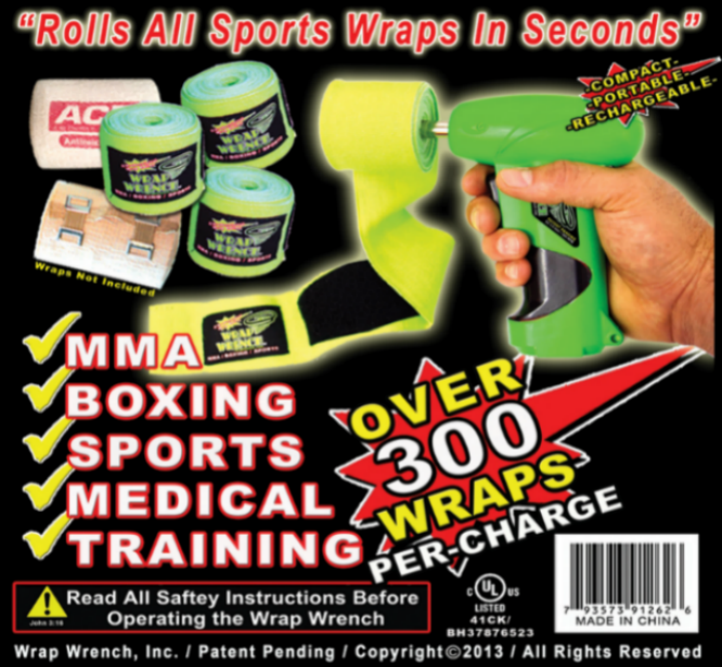 The Wrap Wrench is a new innovative product that increases the quality and speed needed, to professionally roll up sport and medical wraps with little to no effort. After years of playing sports, weight lifting and Mixed Martial Arts, (MMA) designer and inventor Brett Siciliano was frustrated with having to roll up his sports wraps after his workouts. After each workout Brett thought, “There has to be a better, faster and a more energy efficient way to roll these long wraps between workout sets and after intense training in the ring. Brett noticed that there were no wrap rollers on the market that were portable, rechargeable and compact to carry in your workout bag. After months of design, Brett took his prototype, Wrap Wrench to the top ranked gyms and training facilities. 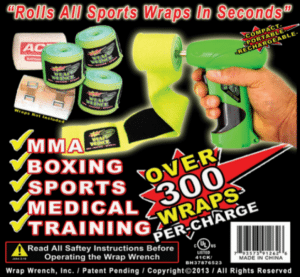 He let Pro fighters and trainers try out his new product and they all loved it and wanted one. The Wrap Wrench was born. The patent pending Wrap Wrench has been designed from the highest quality material, made specifically for the high demands of the professional athlete. Brett was nice enough to send me a Wrap Wrench to try out for this review. I took it out to some of the big named MMA gyms here in Vegas and people were very impressed. Everyone I showed it to, guys fighting for the UFC to random kids from my son’s BJJ class, used it with ease and immediately wanted one of their own! The Wrap Wrench is legit. It has been reviewed in Ultimate MMA Magazine, TapouT Magazine, MMA Worldwide Magazine, Black Belt Magazine, MMA Business Magazine and many more. Rating: We’ve given the Wrap Wrench a 1 star rating. This is another one of those products that was a great IDEA but the reality leaves you sad. Many reviewers loved the product… then it broke. We experienced the same thing which might be why Revgear quit carrying the Wrap Wrench. We recommend this one from Meister. Here’s the bottom line on the Wrap Wrench: We haven’t been able to find a Revgear Wrap Wrench for several months. Even if you can find one we don’t really recommend them any longer. They say they will last 300 wraps on one set of batteries – the only problem with that is that the machine itself never lasted that long! This is an individual product review for the Wrap Wrench, if you want to read about the best Glove Accessories, then you need to check out our Best Glove Accessories Review.